Many things aren't nearly as difficult as they seem. First impressions can be very dangerous. When it comes to a person's outlook - a negative one can ruin everything. Instead of seeing opportunity and chances to grow, they cower in fear and go for the safe, old ways. It can be a huge waste, not just in business but in overall life. Working in a digital marketing agency (or even creative), you inevitably deal with some unreasonable nightmare clients - 'Need this in the next 10 mins! ', 'What am I paying you for??' or 'No, just do it again but differently!' just to name a few. When you deal with these clients, it can be very demoralising, depressing and you may even consider running away forever. It's normal. But there's hope. Positivity help keeps you sane - nightmare clients = work = food on the table. It might not be easy, but it does often lead to exciting opportunities (in our case, it's digital marketing recruitment!). 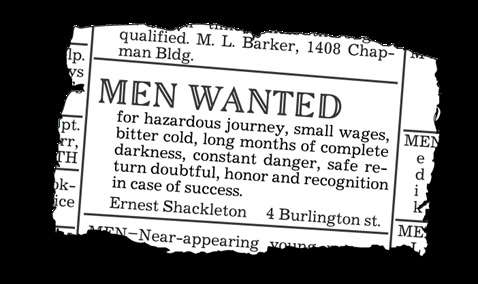 Ernest Shackleton's classic job ad. Often when you send a job ad out, you get millions of emails - many people blindly applying to any job. It's maddening and becomes a real chore working through the CVs and cover letters. But it's unnecessarily difficult if you spend some time figuring out who you're trying to target, and how you might be able to give them an advantage/opportunity to stand out. I've recommended adding silly little tasks/questions to job ads to pre-qualify candidates, and it's worked very well in the past. Instead of receiving 100 emails (estimates to prove a point), I might get 10 - but almost all 10 would be perfect candidates. It's really just understanding marketing. You can read the full article on Medium here.